Aastra provides a wide range of IP phones and devices to choose from. 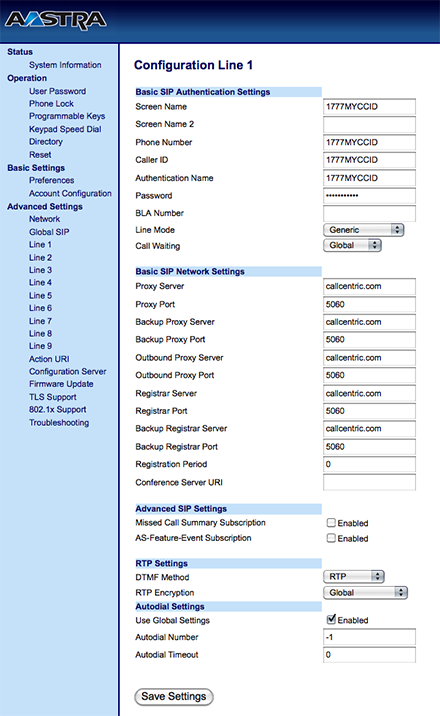 In this guide we will be focusing on configuring the Aastra 6753i SIP phone, running Firmware version 2.6.0.66. You may also use this guide to assist you with configuration of similar Aastra products. In this guide we will go through configuring the Aastra 6753i in order to register it to the Callcentric servers so that you will be able to place and receive calls using your Callcentric account. Before moving forward please ensure you have properly added the device to your network and that you have acquired the proper IP address. The phone should be turned on and running and you should have access to the device's configuration menus. Your IP Address should be shown to you, along with other network information. If your IP Address is 0.0.0.0 please make sure that your device is properly connected to your network. If you do not have this information then you will need to either reset or acquire this login information. Unfortunately we would not be able to provide support on this topic. You may however visit the Aastra support page for your specific device. Phone Number: This is either the default extension 1777MYCCID OR 1777MYCCIDEXT, where 1777MYCCID is the 1777 number assigned to you by Callcentric and EXT is the three digit extension you are trying to register this UA to. Caller ID: This is either the default extension 1777MYCCID OR 1777MYCCIDEXT, where 1777MYCCID is the 1777 number assigned to you by Callcentric and EXT is the three digit extension you are trying to register this UA to. 3. The press the # button to confirm the restart.